In stock -This product will ship today if ordered within the next 7 hours and 15 minutes. Solgar® Omega 3-6-9 is a premium blend of Omega 3, 6 and 9. Fatty acids which are derived from fish, flaxseed and borage oils. These essential fats are required for several physiological functions and need to be part of our diet as the body cannot make them on its own. Omega 3 consists of EPA (Eicosapentaenoic Acid) and DHA (Docosahexaenoic Acid). These are commonly found in oily fish such as sardines, mackerel and salmon. It also includes ALA (Alpha-linolenic Acid), which fish naturally convert to the all-important EPA and DHA, but our bodies can only convert small amounts. Omega 6 is made up from linoleic acid and gamma-linolenic acid, and can be found in several oils and nuts. 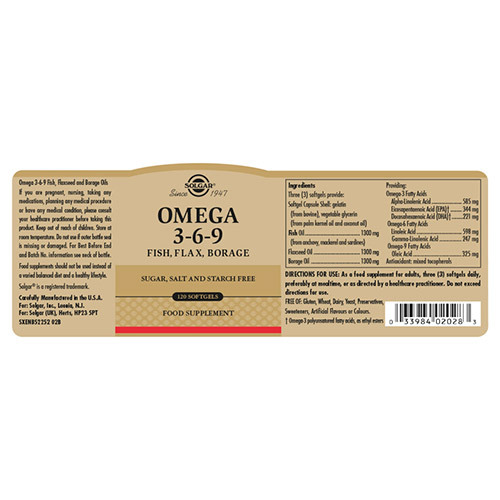 Omega 9 can naturally be found in food which contains oleic acid such as nuts and oils. The ratio between these fatty acids is very important, especially the one between omega 3 and omega 6. 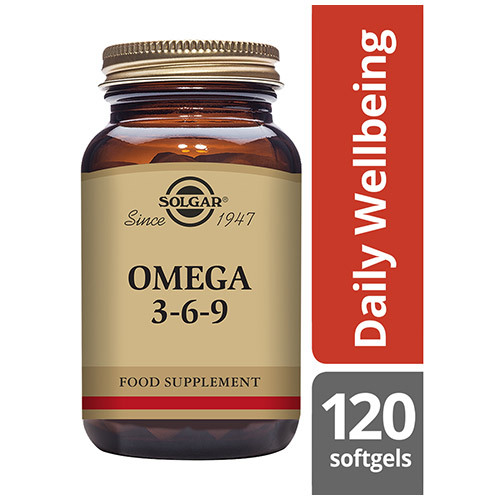 Solgar® Omega 3-6-9, with its 3 a day dosage, provides a higher ratio of omega-3 oils, both from fish and flax, which are complimented by the high quality omega-6s from borage and flax oils, as well as omega-9s in the form of oleic acid, also from flax oil. Fish oils are susceptible to different contaminants as these are often present in the food fish consume. Contaminants are often present at the very bottom of the aquatic food chain in marine organisms in the sediments of fresh and ocean water. 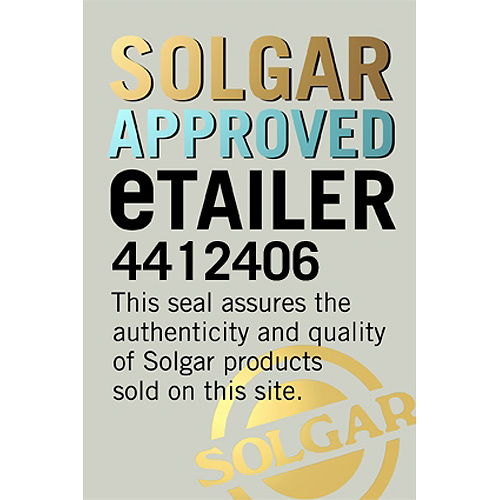 To ensure purity and safety, Solgar’s Omega 3-6-9 uses oil that has been molecularly distilled to remove mercury, PCBs and other heavy metal contaminants. Also contains: Softgel Capsule Shell: gelatin, vegetable glycerin; Mixed Tocopherols. Softgel Capsule Shell: gelatin (from bovine), vegetable glycerin (from palm kernel oil and coconut oil); Fish Oil (from anchovy, mackerel and sardines), Flaxseed Oil, Borage Oil, Omega-3 Fatty Acids: Alpha-Linolenic Acid, Eicosapentaenoic Acid (EPA), Docosahexaenoic Acid (DHA); Omega-6 Fatty Acids: Linoleic Acid, Gamma-Linolenic Acid; Omega-9 Fatty Acids: Oleic Acid; Antioxidant: mixed tocopherols. As a food supplement for adults, take three softgels daily, preferably at mealtime or as directed by a healthcare practitioner. Do not exceed directions for use. 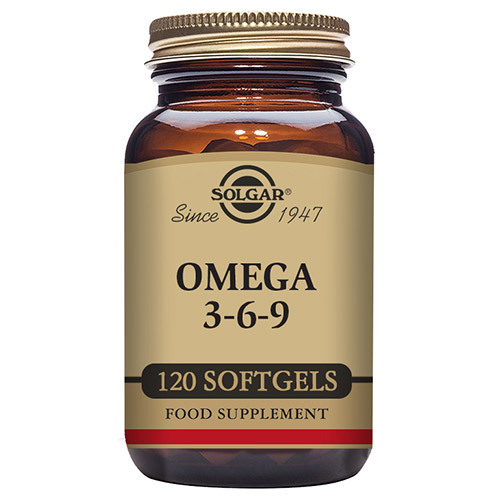 Below are reviews of Solgar Omega 3-6-9 - Fish, Flax and Borage - 120 Softgels by bodykind customers. If you have tried this product we'd love to hear what you think so please leave a review.